Stunning contemporary lakeside home! Great for intimate family gatherings or romantic getaways! 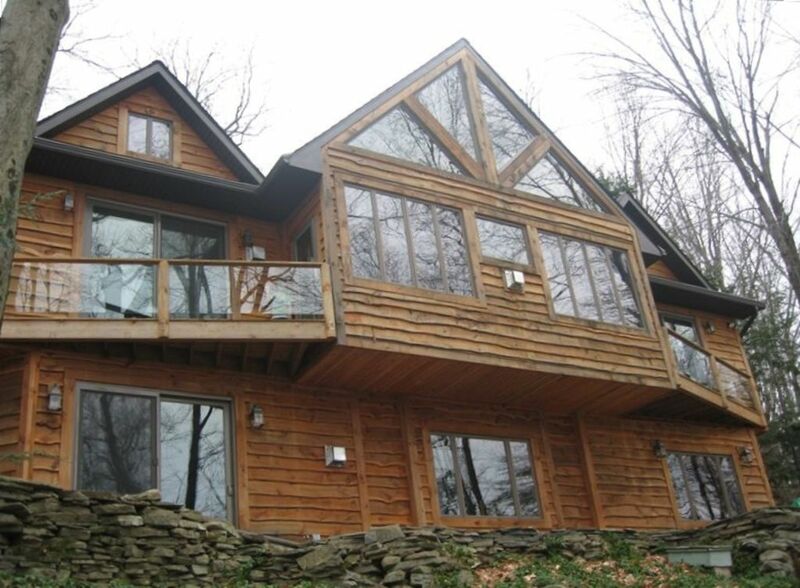 4,400 square feet of custom built, luxury log living, on the west shore of Lake Wallenpaupack. Enjoy 5,700 acres of recreational lake activities, right out your front door. Magnificent master suite with cornerstone fireplace, private balcony, and walk in closet. Master bath has Jacuzzi, shower and double vanity. Two private guest suites upstairs with full bath. Spacious living room features full bar, fireplace, two story exposed beams, and cathedral ceilings. Upstairs loft area with private half bath. Two custom kitchens, with all the amenities of home. First floor suite has private access and full bath. Hear the lapping of the waves from 3 of the 4 bedrooms! Be treated to Bald Eagle sightings year round! 3 of the 4 bedrooms and Loft area have window units. Ceiling Fans in every room. AC is rarely needed on the lake! We have newly installed wall unit in the kitchen/ family room area,, and window units in the loft. Stereo, HDTV, Wii games, ping pong/pool, air hockey and more. Private dock.. bring your boat, relax and enjoy! Our home is located in a private community. Lease is limited to 16 persons. No Parties, or groups under the age of 25, need apply. Weekly rentals only,, latter part of June - Sept.
Greetings, Thank you for taking a look at my site. I am a mother of three,, 1 boy, and two girls,, ages 19, 17 and 13. I have my hands full!! Live in Skillman, NJ (just north of Princeton) with my hubby Bryan on 7 acres. I grew up in Ithaca, NY,, where my father was a professor at the Hotel School at Cornell,, for 40 years.. 'Prof Chase' I attended Goucher College, met Bryan skiing at Hunter Mountain... We have lived in Mahwah, then Montville, and have been on our 7 acres in Skillman for 15 years! Love it! I am a wife, mother, chauffeur, room mom, trustee of the Historical Society, member of the Sourland Conservancy, Friends of Open Space, member of the Princeton Elks Lodge, and teach at the Blawenburg PreSchool. We chose this property for its location... situated halfway between Ithaca, NY (my parents) and Skillman, NJ (us). It's the perfect spot for the grandparents to enjoy spending time with their grandchildren! Large enough, that everyone can be comfortable,, and the kids can bring a friend or two, to enjoy vacation. We also chose this home for its 'beach'... Most homes we looked at, had many stairs,, or boulders to climb over, to get to the water... From June on,, we have a lovely pebbly beach, that the kids can romp on, and get into the water. Perfect for all to enjoy! Our home is breathtaking! When you walk in the front door,, The blue water of the lake is within your reach, and the log architecture is amazing! The floors were imported from British Columbia, and the chairs and dining room table made by hand in Stroudsburg, Pa. Plenty of space for families to gather together,, or spread out,, and do their own things. There's NO better place, than on the dock at Sunrise! With a coffee or tea in hand, sitting back in a 'beach' chair. Mist is rising from the lake, the sky is a magical mix of red, white, pink, purple and blue... It's perfectly quiet,, except for the Loons and ducks 'talking',, 'Sunnys' are jumping for bugs The small birds and chipmunks are making the woods come alive behind you. If you're particularly lucky, you'll get a glimpse of an Osprey or Bald Eagle,,, silently flying overhead. Nature at its best! Beautiful! You can hear the lake water lapping at the shore, from 3 of the 4 bedrooms! 3 of the 4 bedrooms are "waterfront"
There's no place better,, than ON the water! Ductless AC in the Family/Kitchen and Dining Room ,,, 1st Floor Window units in 3 of the 4 bedrooms. Window units in the loft. Two Kitchens! Main has two ovens,,Butlers kitchen, with refrigerator, sink and large pantry. Pavers run the entire length of our home lakeside,, Perfect for perching on, and watching all the lake activities! Rented this property to spend the Fourth of July weekend with a close knit group of friends. I have spent many summer weekends on the lake and for those unfamiliar, it's an absolutely beautiful area perfect for water sports, fishing, and boat rides. The waterfront property really takes advantage of this with a dock right in one of the most popular coves. The house itself was even better than we had imagined. It was a cozy but yet very spacious layout. Extremely clean and well maintained with a modern log cabin feel on the inside. We only had 9 but for families you could very comfortably fit 15. There is also a loft with pool ping pong table and air hockey. While we only spent a little time in this area it would be just another reason families would enjoy this house. It rained almost the entire day Saturday but we had almost just as much fun hanging out inside. The owner was also very easy to work with. We were able to communicate throughout the weekend very easily as she made herself available from the beginning of the weekend. Overall we couldn't have been happier with the house and property and will hope to return in the future. Thanks again for staying with us,, taking care of our home,, and for your kind words! I would rather hear about something and take care of it,, than have you leave unhappy. Our lake offers a myriad of activities! Swimming, boating, jet skiing, tubing, water skiing, canoeing, SUPing, fishing, bird watching, watching the sun rise, relaxing. Come enjoy our home on the Lake! The house is truly amazing. It was bigger and had more amenities than I had even imagined. All 14 of us slept very comfortably and truly had an incredible weekend. The master bedroom is very large with a beautiful private bathroom, balcony and king sized bed. Most of the bedrooms have windows or balconies which look out over the lake. The property is gorgeous and sits right on the lake. We were able to rent boats and tie them up right on our private dock. The lake itself is beautiful and the perfect size. Big enough to explore all day by motor boat, yet small enough not to get lost. The dock is great although can't fit too many people and is covered by shade around 12-1 PM. Kim was very quick to respond to any requests or concerns I had. She made us feel very welcome and truly enhanced our overall experience. My only issue with the property is the gravel driveway. It is very steep and the gravel makes it difficult to enter and exit, so be careful! I'd recommend backing down the driveway to make it easier to get out. Overall, everything was perfect. I highly recommend this rental and would certainly rent again. It was tough to leave. Greetings Brooklyn! Thank you for visiting, and for your kind words! So glad everyone had a fabulous time! There are plans for the driveway to be paved in the Fall! I've been waiting for that ,,, myself! A paved drive will make it easier for guests to visit in the winter months too! The lake offers a whole new experience,, when it's frozen over! Come visit us on Lake Wallenpaupack! We're still basking in the afterglow of one of the best family vacations we've ever had. This beautifully appointed, spacious home on the largest cove in Lake Wallenpaupack is truly a little bit of Heaven. The first class, rustic interior can accommodate a large group of all ages. The master bedroom, with a king sized bed and spacious bath, which includes a jacuzzi tub and a stand-alone tiled shower, is fit for a king and queen. Three other bedrooms, one of which is on the kitchen and patio level and suitable for parents-in-law, and full baths within short steps, provide plenty of privacy. A third floor loft, with two sets of bunk beds, a ping-pong and pool table, board and video games, is a perfect setting for kids indoors where they can make all the noise they want without annoying the adults. A large picture window in the dining area provides a panoramic view of the lake. Add the patio, fire-pit area below, and the lake-front dock and swimming area suitable for young children, and this vacation home is perfect for making family memories. We'll be back next year; can't wait. at our home,,, that's what it is for! I have your week waiting for you next year! We enjoyed the week we spent here. There are quite a few stairs, which was fine for the ages of our party. The lower level was fine for our elderly guest with limited mobility, once she got there, as there was a bedroom, bathroom, kitchen and entertainment area all on that level. The water for the shower and bath had an unpleasant odor. There was a water filter on the fridge, although it ran slowly, but we mostly used bottled water for drinking and cooking. The location was fantastic with fairly easy accessibility to grocery stores. The view was tremendous and we spent much time on the patio communing with nature and enjoying the lake view. Thank you for your compliments! It IS,, a truly magical place! Eagle sightings, chipmunks and squirrels chatting, birds singing and children laughing and squealing in the Lake..
Everything is on the main level,, ( Queen Bedroom, 2 Kitchens, dining room, family room, laundry, full bath, step on to the patio to enjoy the lake)no need to go anywhere else! Let the young ones run upstairs to bed. And the water,,,We have the freshest, coldest, most delicious Pocono Mountain water! Totally harmless, and 20 min in a pitcher in the fridge will make that bouquet disappear! Come enjoy Lake Wallenpaupack at our lovely home! wasn't so blazing hot for our week, but thats a problem for older folks. Also, it could have been a little cleaner, we found cobwebs on the walls in several of the bedrooms, if they use a cleaning service, they need to have them "step it up", but all in all, a good place to rent & we're thinking about renting it again, maybe in the off-season. We have been renting house for as long as I can remember and by far, this has been the BEST home we have ever rented. Beautiful, clean and well appointed. We enjoyed our quiet winter weekend on the lake. Our intention was to head over to Hawley or Skytop for some winter activities (ice skating, skiiing, snow shoeing, etc) but we never left the house. We enjoyed ice skating on the lake out back and sledding down the driveway. It was a winter wonderland. Both kids and adults had a wonderful time. It was a memorable 60th birthday weekend for my dad. We are hoping to return to the house for a week this summer. PLEASE!!! Email me to inquire about proper rates! Nightly rates may not be correct on this site... Cleaning Fee only applies to weekend rentals.